A reader recently asked me to write about tea drinking in Russia. It’s an appropriate topic. Contrary to popular belief, the favorite beverage in Russia is tea, not vodka. Drinking tea has been going on in Russia for a very long time; thus it is woven into the cultural experience. Russians love drinking tea, and, of course, there is also a social dimension to it. Just as in America when someone says, “We need to get together for a cup of coffee,” that person is probably not just wanting to have someone sit across the table while he or she drinks coffee. Before I get into the specifics of tea drinking in Russia, however, I would like to add a couple of observations. 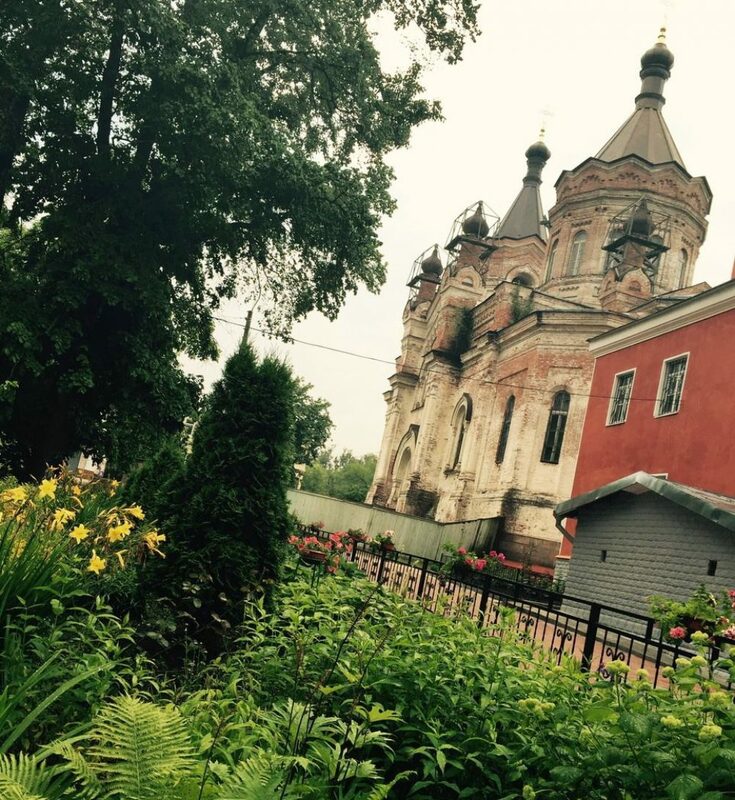 My blog is about my “two worlds,” small town southern America and small town northwest Russia. Drinking tea was also an integral part of the southern culture of the United States where I was raised. I could scarcely imagine going through a day without drinking tea. Of course, the tea there was different in the sense that all the tea we drank in our house was iced and sweet. You had to put the sugar in while it was being made, not after it was cold in the glass. Growing up I was aware that some people in other places actually drank hot tea. In South Carolina, however, we liked most of our beverages cold. One could buy cold lemonade, iced tea, cold beer or whatever. The only hot drinks we drank were coffee and–especially on those rare occasions it actually snowed–hot chocolate. Russians, however, rarely drink liquids that are cold. I noticed when we lived here earlier that it was more than just not choosing to drink cold drinks. It seemed to me there was a mysterious aversion to it. It became more clear to me after we moved back to America. My in-laws came to visit us from Russia. We noticed the milk was being left out of the fridge frequently. At first we thought it was our older son Roman being careless and forgetting to put it back in the fridge. But then my wife saw her mom actually taking it out of the refridgerator well before meal time when we were going to give the boys milk to drink. There is this idea among many Russians that cold drinks are not healthy. The culprit for a cold or sore throat is often traced back to the fact that the person must have consumed a cold beverage… straight out of refrigerator – gasp!!! Every time my father-in-law gets a sore throat he seems to be able to recollect the fact that he foolishly drank something cold from the fridge at some time. Now, as someone from a very warm climate I find this odd in a country where many Russians observe Epiphany, a holy day in Russian Orthodoxy marking the birth and baptism of Jesus, by taking a dip in the frozen waters of the Russian winter. Epiphany is January 19! I have seen them literally cut through the thick ice to be able to get in the water! Another belief in Russia is that running out in the snow with nothing on but your speedos will build up your immunity to sickness. Some children here are encouraged to go out in the snow in their bathing attire and roll around and play in the snow. Of course, as is well known, folks here love going to the banya to take a steam bath. After sitting in temps around 120 F, they then run out into the snow wearing, well, little or nothing at all. These things are done to build up the immunities for the cold here. Now, I am not able to say whether or not exposing oneself to the winter elements in such a manner either does or does not build up immunities. It does seem a strange to me that the people who think drinking a glass of cold milk from the fridge will make your kids get a sore throat are the same ones who believe “Junior” needs to head out into the snow with nothing but his bathing trunks on so he’ll be healthy. Obviously my American prejudices come through sometimes! Tea was brought to Russia probably in the 17th century. Apparently over the years it came mostly from either China or India, but my understanding is that it was also grown in the old Republics of Georgia and Azerbaijan or the Krasnodar Krai. Just based on my perusal of the teas available and purchased here in Luga, it seems, at least where I live, that Indian and “Ceylon” tea is the preference. For many years tea was brewed in a samovar (самовар or ‘self-boiler’), which was a metal container used to heat or boil the water. It had an attachment around the top to hold the teapot which was filled with tea leaves and thus eventually the tea concentrate. The samovar became extremely popular in Russia. I saw many when we visited my wife’s family in Tula (my wife was actually born there). Back in late 1800s there were 28 samovar factories in Tula! This gave rise to the old idiom about avoiding taking something not needed to a place where it is in abundance, “В Тулу со своим самоваром не ездят.” (“You don’t take a samovar to Tula.”) Today, however, the samovars are not really used anymore unless you just like the feel of making tea the really old fashioned way—or perhaps to impress friends. In Tula today there is a Samovar Museum which is absolutely fascinating. One can find samovars bearing the images of the Tsars and others with the Soviet leaders or scenes from life in old Russia. Black tea was probably the only early choice. It still is probably the most common preference, alhtough green tea has become increasingly popular. There are, however, a multitude of choices. Our family does not drink as much tea as most Russian families, since we are somewhat “Americanized.” When I went to look at our “supply,” however, I found we had at least ten different kinds of tea on top of our convection oven. In addition to the usual basic black or green teas (and more than one “brand” of each), we also have have “ginger and orange green,” “Moroccan mint,” and a couple of other flavors I don’t readily recognize. In restaurants you can get a variety of “mixes” as well. “Fruity” flavors are now available, and the herbal teas, which have a long history in Russia, are increasing in popularity—or so it seems to me. Tea is usually drunk here with lemon and sugar, but obviously not everyone drinks it the same way. A very old method was to drink the tea and take a small bite of sugar, but I personally have never seen anyone drink it that way. Tea is consumed at any time of the day, but it is traditionally always served at the end of the meal with the dessert. I have never been to a meal in anyone’s home that did not end with tea. This is the social time when people really chat and reflect on things going on in politics, the community, or with the children. The last time I had tea at my in-laws it led to getting out a lot of old pictures from the old Soviet times when Oksana was small. This time is truly Russian tea time, and this is how you get to know each other better. Even when drunk during the day it is usually with something that is sweet: some home-made preserves (that a lot of Russian women pride themselves in! ), honey, some chocolate candy or cookies. (Generally speaking cookies or other desserts here are not as sugary as in America.) The Russian expression “something for tea” means something sweet. If my wife told me to pick up “something for tea” when I go to the store, I would get a small box of cookies. The tea that is poured in your cup is often very strong, and then hot water is provided so that you can make it to your desired strength. Tea is very important and each person determines how he or she prefers it. I came to Russia not really caring for hot tea of any kind or color. At first, I would look for Lipton tea in the small bags for hot tea since lipton was the brand I recognized. Further, it tasted like “regular” tea (that is, tea I was used to) that was just heated. I now have learned to like other teas here very much and will not return to Lipton. I still don’t drink a lot of tea compared to most Russians. When I first started drinking it I would normally put a small amount of sugar and a little lemon. When eating something sweet I just put the lemon slice in the cup without sqeezing the juice into it and leaving off the sugar. Then I was given tea as a present from my mother-in-law for “Defender of the Fatherland” day. It is Richard Royal Ceylon Black, and it is the best I’ve had. It is “loose leaf tea,” which I now prefer to the tea bags. We, as most Russian households, have an individual “tea cup,” which has a metal filter which fits inside the cup. I boil the water, and then pour it over the tea in the filter which, in turn, is in the cup. I let it “sit” for a few minutes, then remove the filter and tea and add more water to make it the strength I want. When I drink loose leaf black Ceylon tea I do not add lemon and usually avoid the sugar as well. After drinking this “classic” black tea I have no desire for the green or fruity teas. Something I have only heard of and read about is “tea mushroom.” I’m still not sure of the details, but it is a combination of yeast and bacteria that many believe has medicinal qualities. According to folks here, drinking it aids in the healing of a cold or sore throat or pretty much anything. My wife says it looks kind of like a small jelly fish in a sweetened tea/water solution. It isn’t moving, but it does look like a living organism. You have to “tend” it. Oksana wants one, but says we’d have to get someone to look after if we took a trip, because you have to change the solution on a regular basis. Otherwise, it’ll become too acidic and the “organism” will die off. I’m still a bit confused on the care of something called a tea mushroom. Oksana says in America it is known as “kombucha.” Never heard of it. Most Russians drink tea out of nice tea cups, and there are some very beautiful tea sets you can buy here in Russia. Of course, around the house we just drink it in whatever cup is available. The most impressive “utensil” I have seen is the crystal glass usually placed inside a holder called a “podstakannik” (подстаканник), a word that means literally “under the glass.” These can be quite elaborate. If you watch old Russian movies of people on trains you most likely will see them drinking tea from one of these glasses with the holders. Nowadays Russians tend to think of them as too old fashioned or “quaint” at best. I love them and want one just for the “snob factor.” They don’t understand why an American would want one, but I think it would be pretty cool to drink tea out of a crystal glass in a fancy silver holder. If you go on Amazon and type in “podstakannik,” you can see a variety of designs, even some dating back to the Soviet times when they were so popular. Despite my political leanings, I love the old Soviet ones. The longer I have lived in Russia I am amazed at how Russian and American cultures are both so very similar and yet, in other ways, so dissimilar. Obviously, my family has a great desire for both “sides” to see the similarities and appreciate the differences. Foods and drinks are important for understanding most cultures, and it is no different in this case. It is very hard for me, as one who was raised in small towns and rural areas of South Carolina, to explain what drinking ice tea meant and means to people of that culture. But if you are from that culture you understand. “Sweet tea” is more than something you drink. There is a bond there. I now feel the “connection” with Russian tea drinking. I transposed those old feelings from my “other” world to a different culture. Will it stop any wars or end the “Putin did it” explanation of every thing bad that happens which is so popular now? No, I don’t think so. But for those who like learning of other cultures or want to visit or maybe even settle down in that culture, it’s a good start.